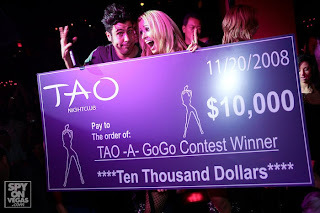 TAO GROUP BLOG TAO NIGHTCLUB LAVO NIGHTCLUB TAO BEACH LAS VEGAS: TAO-A-GOGO!!!!!!!!!! With almost 100 contestants geared up in their best gogo outfits we took to TAO to find the new TAO-A-GOGO champion on Thursday! With our special guest MC Pete Giovine hyping up the corwd and keeping the contest moving we had SO much fun! We actually decided to be a guest judge this year along with my co-worker Kara Lewis and our friend Jack Colton of Jackcolton.com. The finals belonged to the crowd though as they chose their new champion!